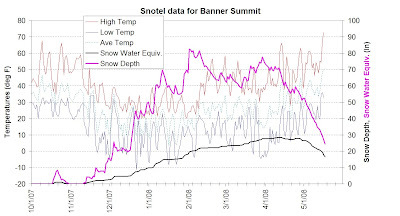 When I woke-up this morning the I saw that the overnight temps at Banner Summit did not drop below the freezing level, but encouraged by the reported 27 deg-F on the Stanley Web cam [http://www.sawtoothcamera.com/] , I got ready and drove to Banner Summit. The drive was wonderful - there were many large herds of deer and elk along the road heading up to higher elevations as the season transitions to summer. I even managed to see an eagle, marmots, and a rare black weasel. In the next chart notice the temps for the last few days (click on image for larger version); the low temps have remained above the freezing level now for a few days for the first time in the season. And as the average temperature rises rapidly the snow depth has taken a PLUNGE! The Snow Depth at Banner Summit - 7000 feet - is below the 30 inch level. 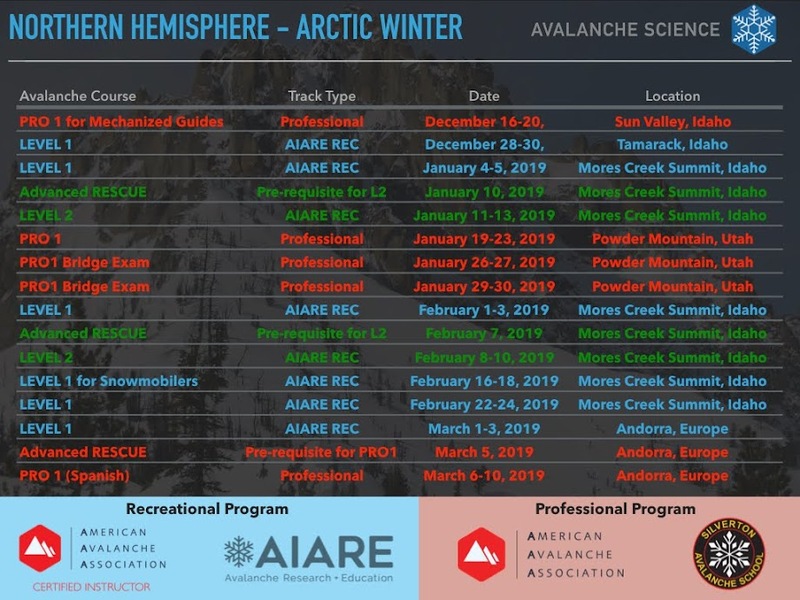 Considering the cooler weather forecast by the middle of the week and the current rate of melting, it is reasonable to assume at that snow cover access to Copper and surrounding peaks will probably last two more weeks. Folks, the last few days' temperatures are making an impact in the snow country. This morning as I drove to Banner summit, I noticed that the Mores Creek Summit area at the 6000 feet elevation is almost depleted of snow, with Winter Corner the only exception. However, the situation is better at the Banner Summit area, where there is still snow at 6000 feet before the second avalanche gate. The window to access Bear Claw Cirque on snow for a second time this season is CLOSING, because the snow is melting FAST at the starting point! I give it not more than one week. The situation at 7000 feet is more encouraging. Check the next picture of the ID-21 road with Copper Mountain NW aspect in the background. You might recall that Bob R. and I skied the Summit and NW chutes last weekend - check last week posting for beta, pics, and videos. Today I visited peak 8477 across the road from Copper Mountain. For the climb I followed the red route. I got lucky and found snow bridges over the two creek crossings. But I suspect they will not last more than a few days. The green and purple routes indicates the ski down. The upper (green) and lower (purple) sections are quite different and discontinuous runs. That is the reason for the different coloring. This year I did not ski Cape Horn mountain, but for your reference I included the up track in yellow. The blue tracks show nice ski runs. The ski run on the SW face of Cape Horn is quite sweet, and in stable conditions it provides one of the most continuous and unbroken lines in the Banner summit area. As I climbed up a mostly NE ridge without the assistance of ski crampons - there was no need since the snow did not freeze overnight - I knew the chances of corn were slim, but I kept my hope that the direct north exposure and elevation would do the trick. By 11:oo AM I was at the top of Peak 8477, and as expected there was no corn, but 20 cm of soft slushy snow. Oh, well!, at least I got a nice tour and skied while people in Boise roasted in 90 deg-F weather. The next picture shows the view from Peak 8477 looking into the north and down to Cape Horn creek. This slope is shown in the topo map as a green track. The next two photos look up into Peak 8477 at the bottom of the top run (green track). Below a view of the top of the run in purple. I have not skied this area in the winter, but these lower runs look fun. Good selections when stability or weather keep you at lower elevations. The day could not be over without some excitement, provided by walking on ski boot on this log across the Cape Horn creek. Next a view of Copper Mountain from the snowmobile trail as I ski down to the parking lot. The last photo is a view of the Sawtooths from Grandjean on my drive back to Boise on ID-21.